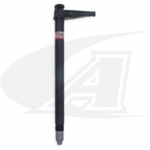 The W-500A (WP-27A), W-500B (WP-27B), W-900 (WP-27BHD) automation series torches feature front or back tungsten loading and tightening which allows the electrode to be lowered or raised within the torch for precise positioning. Each torch is designed with an integral gas lens collet body to insure consistent gas flow coverage for demanding TIG welding jobs. 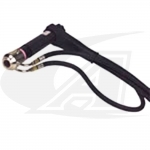 Torch packages come with heavy-duty power cable, water and gas hose leads. Cable lead sets are available in 3' (0.9m), 12-1/2' (3.8m) and 25' (7.6m). Custom cable lengths, fitting combinations etc. are available please contact Arc-Zone Customer Care for more info.